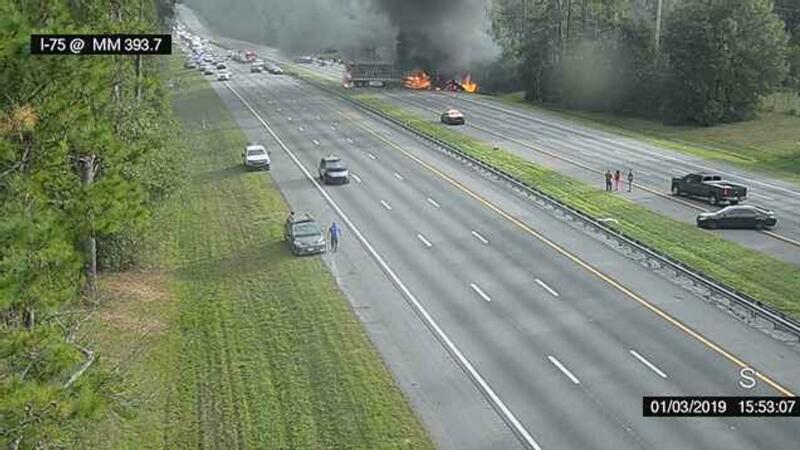 This image taken from a traffic camera shows a fiery crash Thursday along Interstate 75 near Gainesville, Fla.
Florida Highway Patrol Lt. Patrick Riordan said at a news conference that as many as eight people were injured and taken to local hospitals in what he called an "extensive" and fiery wreck. At about 3:40 p.m. ET, a semitruck and a car traveling north along Interstate 75 near Gainesville collided, crashed through the center guardrails and smashed into a southbound semitruck and a church van carrying the children. The trucks burst into flames. Another car then slammed into the wreckage. The children ranged in age from 9- to 14-years-old and were traveling from Avoyelles Parish in central Louisiana, according to the highway patrol. In a Facebook post, Kevin Cox of the Louisiana district of the United Pentecostal Church International said the van was carrying members of its Marksville, La., congregation. Nine children were in the van at the time of the accident, as were three adult women. "One of the ladies is pregnant and 'pretty banged up'," Cox said. "But doctors have been able to keep her and her unborn baby stabilized." Among the children who died was the granddaughter of the congregation's pastor, Eric Descant. His wife was seriously injured in the crash. The four surviving children all sustained injuries but are expected to recover, Cox said. "It's just beyond belief," Marksville Mayor John Lemoine told the Ocala Star-Banner. "We are a small community with 6,500 people in town. ... It's affected everybody. That is what's so terrible about this." The drivers of the two semitrucks, both adult males, were also killed. Officials say they don't yet know what caused the wreck and have opened an investigation. The driver of the truck involved in the first part of the accident had received multiple tickets in the past decade, including for speeding and driving an unsafe vehicle, according to the Associated Press. Video from the scene showed bodies and debris strewn across the roadway as thick smoke billowed from the burning wreck. "We kept seeing these little explosions and fire," Nicole Towarek, who witnessed the crash, told The Associated Press. "The heat, it was insane." Dozens of gallons of spilled diesel fuel fed a giant fire that damaged the roadway itself, according to the AP. Traffic on Friday morning was still backed up for miles, reports Grace King of member station WUFT. Officials announced Saturday that the highway has been repaired and is fully reopened. Riordan said the state highway patrol has notified the National Transportation Safety Board of the accident, although that agency is currently being affected by the prolonged partial government shutdown. NTSB investigators won't be able to start an examination of the crash until the government reopens, King reports. "It's unbelievable. Everybody is in shock," Maxine Doughty, a member of the Marksville congregation, told the Star-Banner. "We had our Last Supper Sunday and the pastor said to live our lives like each day is the last day."